Holland & Sherry: Britse stoffen voor het laten maken van een pak, colbert en broek. Holland & Sherry supply the most luxurious and highest quality cloths worldwide. We endeavour to create the finest fabrics supplying the finest tailors with the finest service, imparting our passion and knowledge along the way. By 1900 the firm was exporting to many countries, it was around that time a sales office was established in New York. In the early part of the 20th century, the United Kingdom, Europe, North and South America were the dominant markets for the company. Amongst other distribution arrangements, there was a Holland & Sherry warehouse in St. Petersburg, Russia – a successful market prior to the revolution and now being successfully renewed. By 1982 the business moved to Savile Row, which remains as our registered head office. In 1968 Holland & Sherry bought Scottish cloth merchant, Lowe Donald, based at Peebles, in the Scottish Borders and decided to locate their distribution to the purpose built warehouse there. Of all the cloth merchants of Golden Square, which were established in the late 1800's, only Holland & Sherry remains. Over the decades we have purchased nearly twenty other wool companies. We are constantly engaged in research for ever fine and more luxurious fibres and fabric qualities; sourcing the finest natural fibres, ranging from Super 240's, cashmere to pure worsted Vicuña. Our cloths are woven in the time honoured way to assured quality and good taste. A bespoke tailored garment in luxury Holland & Sherry cloth is truly an investment and always a pleasure to wear. This collection of fabrics has been woven from fine merino wool that has been blended with the technical fibre polyester to produce a fabric that combines the benefits of natural and manmade fibres. When tailored this remarkable cloth results in garments that are durable, excellent for travel and easy to care for. 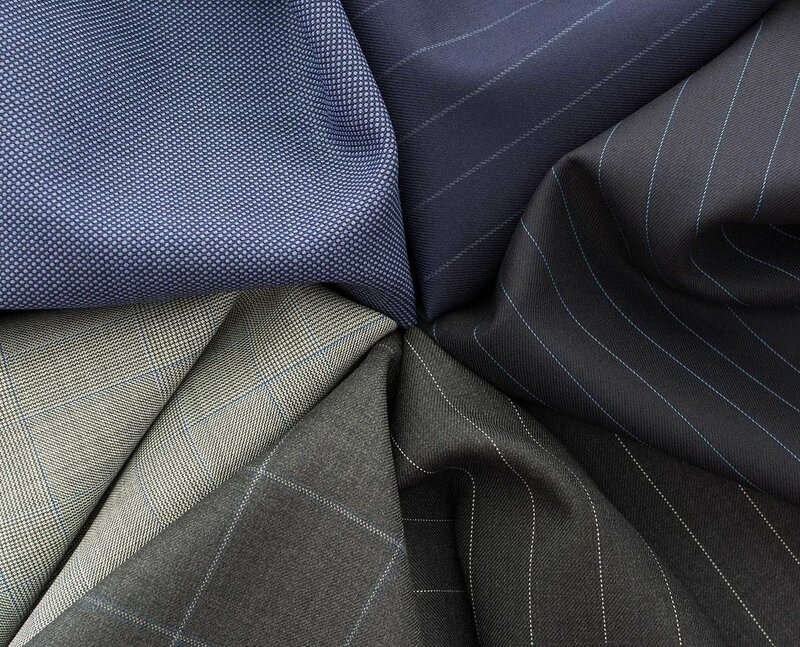 This season Holland & Sherry debuts its first suiting collection of wool Lycra® fabrics. Comprising a series of solid plains in twill, prunelle and plain weave constructions, and a comprehensive collection of stripes, small neat designs and glen checks, this collection is sure to please all. Fabrics in this collection stretch and move in line with the body making them the practical choice for those that are always on the go. Oceania is a collection of lightweight summer jackets inspired by the colour blue. Blue is nature’s colour for water and sky, and is frequently used in the English language to express one’s mood or state of mind. Blue is also used in the term “blue blood” when referring to the aristocracy. Blue is a colour that is elitist, but understated, and suits most; hence its popularity. Holland & Sherry is certain that the Oceania jacketing collection will have that perfect shade of blue to suit all. Holland & Sherry’s new and exclusive jacketing collection Xtreme Lightweight draws its influence from some of the world’s greatest fashion capitals. Offering a series of interchangeable designs in a variety of colours that can be styled together or independently to produce the ultimate collection in bespoke tailoring and couture design. 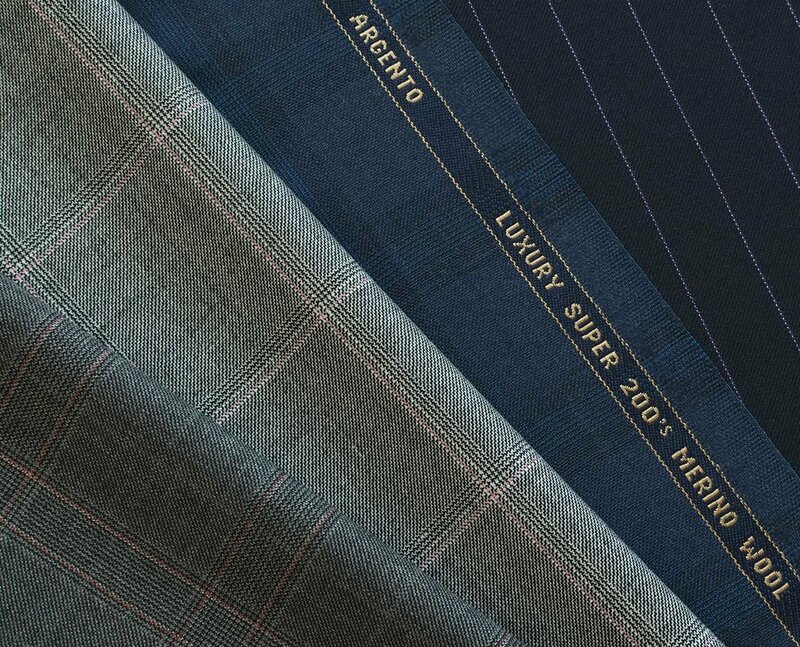 Luxury Super 160's with Cashmere and Silk. Merino sheep are prized for their superfine wool, which is the finest and softest of any sheep. Careful breeding has helped produce fine micron wools with fewer imperfections and less fleece contamination, giving it limitless possibilities for cloth production. For this collection Holland & Sherry has created an intimate blend of hand-combed cashmere and mulberry silk to produce a 1/62Nm yarn that has been proportionally woven with a 15.5µ superfine merino wool. In this combination, all three fibres enhance the performance, drape and handle of the cloth, ensuring superior quality and exquisite refinement. Our latest Cashique collection incorporates all the qualities described above, and offers a comprehensive selection of attractive and sophisticated new designs. This collection of light weight fabrics has a luxurious handle and drape, making it the ideal choice for tailoring into a summer jacket. The Royal Mile is in the heart of Scotland's historic capital Edinburgh. It is one of Scotland’s oldest and most famous streets and is the link between Edinburgh Castle and the Royal Palace of Holyroodhouse. The name implies the distance between these buildings is one mile, however the reference is to one Scots mile, which equates to 1976 yards rather than an Imperial English mile which is 1760 yards. This quality may be recognisable by some as it has been a significant part of our collection for many years under a previous name – also referring to distance! 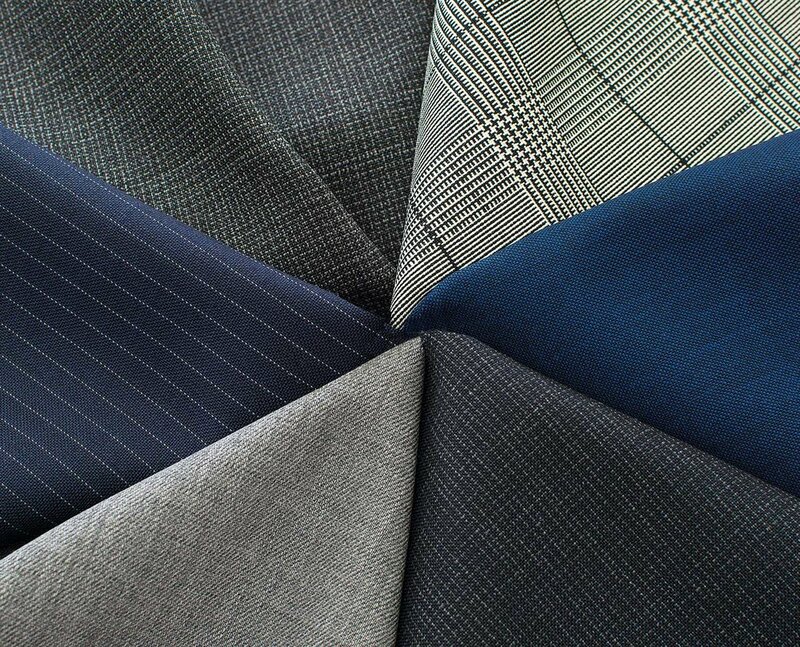 The collection contains a range of classic weaves offered in traditional suiting colours. It is the perfect all-season suiting for the distinguished individual. Due to the success of Holland & Sherry’s Royal Mile 1976 suiting collection, we have developed a series of plains in the same quality, and are delighted with the results. This comprehensive collection offers a variety of both contemporary and classic coloured plains woven in a traditional serge construction. The cloths in this collection are very versatile and would suit any occasion, whether it be the office, visiting the country or relaxing on holiday. Woven from a plain weave construction, Snowy River Lightweight offers a diverse range of stripes, glenplaids and small colour woven neat effects. The colour palette reflects the true spirit of summer ranging from classics to more contemporary tones adding another dimension to this classic quality. This collection of high performance, plain fabrics has been woven from Super 120’s wool worsted with Teclana®. Teclana® is an exclusive technical fibre developed by Holland & Sherry, it combines the natural benefits of wool with the technical advantages of Teclana®. Included in this collection is a comprehensive range of coloured, plains in a regular twill, cavalry twill or a whipcord construction. Holland & Sherry’s Argento collection combines the natural beauty of superfine 13.5µ merino wool with ones of the world’s most natural and valuable precious metals – silver. This collection is the epitome of style, sophistication, elegance and luxury, and has been designed with the true luxury connoisseur in mind. Superfine 13.5µ wool has been encapsulated with silver; one of the world’s most precious metals, to produce a luxury, performance fabric that surpasses all others. Sherry Silk is a selection of contemporary jackets woven from a blend of Super 140’s merino wool worsted and silk. The selection encompasses an array of designs and colours to suit all tastes. The cloths in this collection have been produced with the connoisseur in mind, from the ultimate blend of the highest quality fibres. Crystal Springs luxury jacketings for Spring/Summer 2018 is an updated collection of windowpane and mock glenplaid in a range of attractive colours, including an array of vibrant blue tones and classic neutrals. Bold, unfussy checks create a fresh and striking summer look.